Leave your personal mark with a Signature Stamp from Presto Stamps. Ordering a self inking or pre-inked custom Signature Stamp online is easy now. We offer good quality products to our customers. No need to give your effort where it is not needed an impression can make it easy. 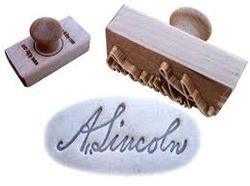 Signature stamp are based on polymer technology with built-in internal stamp pad. A rotation action causes the Signature stamp stamp dye to hit the internal stamp pad between each use. Signature stamps are great for multiple stamping, are easy to refill, and reasonably priced. A Huge Variety of Pre-Inked Stamps with around 25 different sizes and in 5 different Colours (Black, Blue, Red, Green & Violet). Multicolour Stamps, Signature Stamps, Stamps with Logo/artwork are all possible with us.